Michael Jackson’s Niece Endorses New Agency As A Leader In The Music Industry At Finding Great New Talent After months of development, ReTake Artist and Music Listing and Promotion Service just unveiled its new website−a dedicated listing service for bands, singers, songwriters and musicians. While announcing the company’s commitment to signing former television talent show contestants of shows like American Idol and The Voice, president Kenneth Schwartz emphasized that the company also handles established talent – as evidenced by the endorsement of Michael Jackson’s smoking hot niece, Tanay Jackson! Mayor Rahm Emanuel and the Department of Chicago (DCASE) today announced the lineup of food trucks for each night of concerts at the Petrillo Music Shell at this year’s Taste of Chicago, July 10-14, 2013. Fourteen food trucks will participate, and alternate spots during the festival. There will be up to seven food trucks each evening. Taste of Chicago concert tickets are still available for Robin Thicke and Neon Trees at only $25 per seat and may be purchased on the Taste of Chicago website at tasteofchicago.us. Lawn seating is free. Many of the food trucks that are serving food have cook-on-board licenses. 103, WGN-Television, WTTW 11’s Check, Please! and 93XRT. The 33rd Annual Taste of Chicago is July 10-14 in Grant Park. 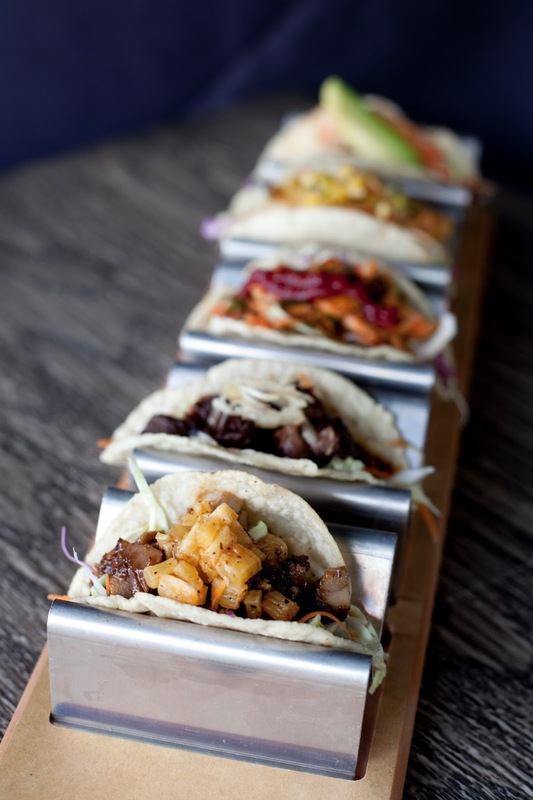 (Taste of Chicago hours are 11 a.m. – 9 p.m., Wed. – Fri.; 10 a.m. – 9 p.m., Sat. and Sun.) For more information on the free admission festival, call 312.744.3316; TTY: 312.744.2964 or visit tasteofchicago.us. To plan your trip to Chicago, visit choosechicago.com. Join the Taste conversation on Facebook at Taste of Chicago and follow us on Twitter, @TasteofChi2013. Chipotle Mexican Grill (NYSE: CMG) plans to serve more than 15 million pounds of locally grown produce in its restaurants this year, up from its 2012 goal of 10 million pounds. As the only national restaurant company with a significant commitment to using local produce on a large scale, Chipotle has steadily increased its locally sourced produce supply since beginning the program in 2008. With many people paying more attention to food and where it comes from, locally grown produce is on the rise. A 2012 Mintel survey of 2,000 adults found that more than half (52%) of U.S. consumers say it’s more important to buy local produce than organic options. Most produce travels some 1,500 miles from where it is grown to where it is consumed. All of Chipotle’s locally grown produce comes from within 350 miles of the restaurants where it will be served. Chipotle will work with a network of more than 70 local, family-owned farms to provide bell peppers, red onions, jalapenos, oregano, and romaine lettuce for its restaurants. Chipotle restaurants in Florida and California also serve locally grown tomatoes, as well as lemons and avocados in California. Chipotle’s use of locally grown produce is rooted in its belief that local produce arrives at its restaurants closer to the time it is harvested and results in better tasting food. Supporting local farms also creates and sustains opportunities for family farms in rural communities around the country. Beyond its commitment to serving locally grown produce, Chipotle also serves more Responsibly Raised® meat (from animals that are raised in a humane way and never given sub-therapeutic antibiotics or added hormones) than any other restaurant company in the United States; more than 120 million pounds in 2012. All of the dairy (cheese and sour cream) served at its restaurants is made with milk from cows that are never given the synthetic hormone rBGH, and more than 34 million pounds of all of its dairy is made with milk from pasture-raised cows. Additionally, the company currently uses organically grown oregano and cilantro and plans to serve 8.5 million pounds of organically grown black and pinto beans this year. Steve Ells, founder, chairman and co-CEO, started Chipotle with the idea that food served fast did not have to be a typical fast food experience. Today, Chipotle continues to offer a focused menu of burritos, tacos, burrito bowls (a burrito without the tortilla) and salads made from fresh, high-quality raw ingredients, prepared using classic cooking methods and served in a distinctive atmosphere. Through our vision of Food With Integrity, Chipotle is seeking better food from using ingredients that are not only fresh, but that—where possible—are sustainably grown and naturally raised with respect for the animals, the land, and the farmers who produce the food. A similarly focused people culture, with an emphasis on identifying and empowering top performing employees, enables us to develop future leaders from within. Chipotle opened with a single restaurant in 1993 and currently operates more than 1,450 restaurants. For more information, visit Chipotle.com. ROSEMONT, IL – This summer, MB Financial Park at Rosemont will be abuzz with the ultimate in dining and entertainment including Rockin’ in the Park, a free summer music festival with concerts every week until August 15. The next concert is Thursday, June 20 featuring the Led Zeppelin tribute band Kashmir. The thrilling King BMX Stunt Show will roll into the park June 28-29. Wednesday, July 3: Arra & Fireworks - Arra is one of the best and largest-drawing classic rock cover bands in the Chicago area. Performing the biggest hits by the biggest bands of all time with precision and excellence, they have also headlined or performed at many of the area’s largest summer festival events. A fireworks show will follow this concert. Thursday, July 11: Libido Funk Circus - Originally formed as an over-the-top tribute to the Disco music of the 70s, Libido Funk Circus has been entertaining a wide range of audiences since its inception. From the hits of the good ole' Motown days to the bass-thumping beats of today's dance music; from the always danceable Disco grooves to the new wave rock of the 80’s, Libido Funk Circus has something for everyone. Thursday, July 18: 16 Candles - Established in 2003, 16 Candles brings all the great 80′s songs you love to life in full force. The members are five fun-loving guys with a simple love for the music of years past and a mission to fuse nostalgia and style to create a sight/sound spectacular unlike any other. Thursday, July 25: American English - This Beatles tribute show was voted “number one” by thousands of Beatles fans as winners of sound-a-like contests at Beatlefest® for three consecutive years. They have also won Illinois Entertainer of the Year and have been voted "Best Tribute Band" three of the last four years by their fans in the Chicago area. been endorsed and praised by many in the media including: 95.1 WIIL Rock, STAR 105.5, 102.3 WXLC and 1220 WKRS along with countless newspaper and magazine publications. Thursday, August 8: INFINITY & Fireworks – With a following that makes them one of the top cover bands in Chicago, INFINITY lights up the stage with their unique vocals and instrumentals performing hits from Boston, Bon Jovi, Led Zeppelin, Styx, Queen, REO Speedwagon and Journey. They are genuine entertainers, and everyone in the audience, no matter what age, will become part of this show. A fireworks show will follow this concert. Thursday, August 15: Breakfast Club - A high energy rock and dance 80's tribute band, every song Breakfast Club plays is a hit that brings down the house. Moonwalk down memory lane with Breakfast Club as they spin you right round to all the radical sounds, styles and way cool dance steps from the 1980s in over-the-top retro 80s attire. About King BMX Stunt Show: King BMX Stunt Shows is a full service BMX entertainment company. Its founder, Kieth King, has been involved with BMX Freestyle since 1985. One of the top stunt shows in the nation, clients range from the NBA, Nascar, IRL, and State Fairs to small town festivals, colleges and high schools as well as shopping malls and company events. King BMX riders have competed at the X Games, Gravity Games and Dew Action Sports Tour, have been featured on Fox Sports and Monday Night Football, and were featured on multiple episodes of the 2012 season of NBC's America's Got Talent (as the American BMX Stunt Team). Videos of their daring performances can be found at youtube.com/user/kingbmxstuntshow. Charlie McKenna, chef and owner of Lillie’s Q that serves award-winning competition BBQ along with Southern favorites, will sell limited release bottles of his Bourbon Barrel Aged Smoky BBQ sauce starting at 11am Friday, June 21 at both the Lillie’s Q Bucktown location (1856 W North Ave) and the Lillie’s Q Chicago French Market location (131 N Clinton St). Chef McKenna took the most popular Lillie’s Q BBQ sauce – Smoky which is a traditional sweet style Memphis sauce with a hint of smoke – and aged it in a Henry McKenna Single Barrel bourbon barrels produced in Bardstown, Kentucky, by Heaven Hill Distilleries for six months. The Bourbon Barrel Aged Smoky BBQ sauce comes in a 16oz glass bottle, features a black and gold label, and is sealed with hand-dipped black wax at the top. Bottles of the Bourbon Barrel Aged Smoky will retail for $15 each. Only 200 bottles of the Bourbon Barrel Aged Smoky were produced. The Lillie’s Q Bourbon Barrel Aged Smoky BBQ sauce was bottled and stored shortly before the fire on March 14, 2013 at the Lillie’s Q Bucktown location that caused significant fire and smoke damage when a hot water heater in the basement malfunctioned and caught fire. 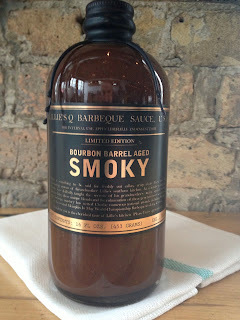 The bottles of Lillie’s Q Bourbon Barrel Aged Smoky BBQ sauce were not damaged during the Bucktown location fire, and all bottles were checked and tasted to ensure the quality of the limited-edition sauce was the same before the fire. The Lillie’s Q Bourbon Barrel Aged Smoky will not be available as a sauce option for patrons dining at the Bucktown restaurant or with to-go orders from either Lillie’s Q locations. The Lillie’s Q Bourbon Barrel Aged Smoky BBQ sauce also not be available for online ordering thru the Lillie’s Q website. The only way patrons can purchase the Lillie’s Q Bourbon Barrel Aged Smoky BBQ sauce is by physically going into the Bucktown or Chicago French Market locations. All sales of the Bourbon Barrel Aged Smoky will be on a first-come, first serve basis. The Lillie’s Q Bucktown location opens daily at 11am daily. The Lillie’s Q Bucktown location closes at 10pm Sunday thru Thursday, and closes at 11pm Friday thru Saturday. The Lillie’s Q French Market location is open from 10am until 7pm Monday thru Friday, 10am until 4pm Saturday, and is closed on Sunday. Lake Geneva, WI (June 19, 2013) – The summer months provide the perfect opportunity to change pace and rejuvenate – which is much needed in today’s 24/7/365 plugged-in society. And the Lake Geneva Area, easily accessible from Chicago and Milwaukee, is an ideal location to enjoy – particularly in the summer, with its abundance of water activities and multiple types of accommodations. Geneva Lake is 21 miles around, three miles wide and nine miles long, affording water sport enthusiasts a sizable playground. Four beaches with bath houses provide ample opportunities for swimming and sunbathing, as well as water skiing, jet skiing, and newly available parasailing and paddle boarding. Boating fans can take advantage of a variety of watercraft rentals, from speedboats to pontoon boats, as well as canoes and kayaks. Several boat cruises offer more relaxed time on the water, from sightseeing to dining to historic excursions. The unique 21-mile Geneva Lake Shore Path, which runs 20 feet from the water’s edge and encircles the lake, offers walkers and runners an unprecedented view of some of the most beautiful homes and landscaping in the Midwest – traveling through the front yards of exclusive century-old mansions. Guided tours are available, with hikes ranging from one hour to one-half day. Plus, Lake Geneva Area visitors can choose from numerous waterfront dining options – from casual to elegant – while they unwind and take in gorgeous views and lakefront breezes. After dinner, the fun continues with lakeside entertainment including live concerts, piano bars, karaoke and movies. And at the end of a day on or in the water, visitors can retreat to their preferred accommodations to rest and refresh for tomorrow. Loaded with places to stay and meeting various budgets, the Lake Geneva Area includes luxury resorts and hotels; boutique hotels; comfortable bed & breakfasts; cozy rental homes and condominiums; and motels, cottages and campgrounds. Lillie's Q Chicago French Market location now serving its full food menu; Lillie's Q Bucktown location now has its Q-Rita on tap and its patio open! CHICAGO (June 17, 2013) – Charlie McKenna, chef and owner of Lillie's Q that serves award-winning competition BBQ along with Southern favorites, is now serving the full and original menu at the Lillie’s Q Chicago French Market location (131 N Clinton St) in the West Loop. Also, the Lillie's Q Bucktown location (1856 W North Ave) now has its “Q-Rita” moonshine-based margarita riff on tap, and its 25-seat patio is now open for business. The Lillie's Q Bucktown location re-opened to the public on Thursday, June 13. The Lillie's Q Bucktown location suffered significant fire and smoke damage when the restaurant’s hot water heater in the basement malfunctioned and caught fire back on March 14, 2013 -- which caused the Bucktown location to close and also forced the Lillie's Q French Market location to serve an extremely limited menu. The full and original Lillie's Q French Market location food menu slightly differs from the Lillie's Q Bucktown location. However, patrons at the French Market location can still enjoy Lillie's Q staples like award-winning competition BBQ (pulled pork, tri-tip, baby back ribs, hot link, chicken), Southern favorites (Brunswick stew, grits with housemade bacon, pimiento cheese, crawfish roll, collard greens, boiled peanuts, and more), and the French Market exclusive offering of housemade kettle chips dusted with either pimiento cheese powder or Carolina Dirt BBQ rub. The full Lillie's Q French Market food menu is attached to this press release. The Lillie's Q French Market location is open from 10am until 7pm Monday thru Friday, 10am until 4pm Saturday, and is closed on Sunday. The Lillie's Q Bucktown location is also bringing back its signature “Q-Rita” moonshine-based margarita riff to the public – and it’s on tap for the first time. The “Q-Rita” is comprised of New Holland Brewing’s Hatter Royale Hopquila, Junior Johnson's Midnight Moon Carolina Moonshine, Lillie's Q Smoky BBQ sauce, triple sec, orange juice, fresh-squeezed lime juice, and fresh-squeezed lemon juice. The “Q-Rita” is served over ice in a 16oz mason jar that’s rimmed with a mixture of Lillie's Q Carolina Dirt BBQ rub and sugar and costs $10 each. The other nine taps at the Lillie's Q Bucktown location serve all-American craft beers. Also, the Lillie's Q Bucktown location’s 25-seat outdoor patio that runs along North Wolcott Avenue opens today for the summer. The Lillie's Q Bucktown location opens daily at 11am daily. The Lillie's Q Bucktown location closes at 10pm Sunday thru Thursday, and closes at 11pm Friday thru Saturday. CHICAGO (June 17, 2013) – Broadway In Chicago is thrilled to announce that five‐time Tony Award® winning PETER AND THE STARCATCHER, written by Tony Award nominee Rick Elice and directed by Tony® Award‐winner Roger Rees and Tony® Award‐nominee Alex Timbers, will play Chicago’s Bank of America Theatre (18 West Monroe) from April 2 – 13, 2014. PETER AND THE STARCATCHER is part of the Broadway In Chicago 2014 Spring Season. Group tickets for 10 or more are now on sale by calling Broadway In Chicago Group Sales at (312) 977‐1710. Individual tickets for PETER AND THE STARCATCHER will go on sale at a later date. For more information, visit www.BroadwayInChicago.com or www.peterandthestarcatcher.com. CHICAGO – “Cirque Shanghai: Dragon’s Thunder” will feature an additional performance on Thursday, July 4, with performances at 2 p.m., 6 p.m. and 8 p.m. The Navy Pier July 4 fireworks celebration will begin at 9 p.m. The performances on Wednesday, July 3 will be performed according to the regular schedule at 2, 6 and 8 p.m.
Back from last year’s show is the fate tempting “Wheel of Destiny,” and China’s finest daredevil motorcycle troupe, “Globe of Death,” returns with not two, not four, but five motorcyclists riding at break-neck speeds within a steel globe. The schedule on Thursday, July 4 is 2 p.m., 6 p.m. and 8 p.m. There will be additional performances on Sunday, Sept. 1 at 8 p.m. and Monday, Sept. 2 (Labor Day) at 2 p.m. and 4 p.m. Originally from a classical music background, Haiping Ge was one of the earliest producers serving in the Shanghai government's Office of Cultural Exchange Affairs. From that office, he hosted many of the first Western entertainers performing in China. For the last two decades, Haiping Ge has been producing shows with ISA for the world's premium venues. His current productions include: Cirque Shanghai for New Victory Theatre on Broadway; ICE! attractions in Dallas, Nashville, Orlando and Washington D.C. in association with Gaylord Resorts; Luminasia at The Galt House in Louisville, KY, USA. Haiping also produced a Chinese acrobatic show for Disney World, Florida which will run through the end of this year.